Successfully Added AV and S-Video To HDMI Convertor Box - Up-Scale Video for HDTV to your Shopping Cart. AV composite cables (red, white, yellow) and s-video to HDMI converter box for up-converting SD (standard def) signals to HD (high def). Bought a new HDTV but have no HDMI devices to attach to your great new display or want to get the best out of your old SD electronics? No worries, now you can both up-convert and play your videogame system like the PS2, DVD player, VCR, or DV camera in beautiful 720P! This unit will take an analog AV input from RCA type RWY cables and convert them to a digital HDMI video signal with stereo output. It also works with video from an s-video cable. Setup of this unit couldn't be easier; simply plug in your units component cables or s-video cable into one end of the converter box and attach an HDMI cable into the other end of the converter and you're ready for some 21st century entertainment. Another great digital accessory brought to you at Chinavasion's usual rock bottom wholesale prices. Order yours before the big game next month! 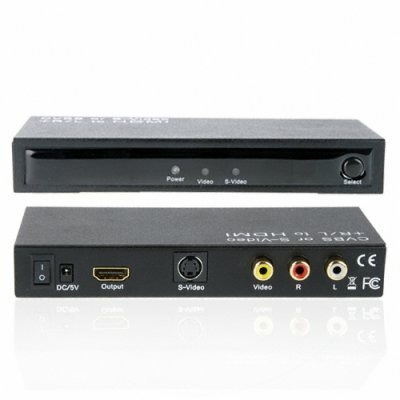 Great AV and S-video to HDMI converter box (up to 720P). Simple sturdy designed metal box fits in nicely to the home theater setup. Up convert standard DVD player and videogame system output to 720P.